I only recently discovered the Harry Smith Anthology but I'm already obsessed. Any further recomendations? What a question! For the past eight years or so, my musical and intellectual life has revolved around my own discovery of the Folkways Anthology of American Folk Music compiled and designed by Harry Smith. You could say The Celestial Monochord's own reason for being is to provide such "further recommendations." But I also hesitate to answer. Much of the energy and diversity in a Folk Revival (which is what's happening today) seems to come from everybody struggling to find their own way. When I ask like-minded people how they found the old folk and blues music — and where they went from there — the answers almost always surprise me. 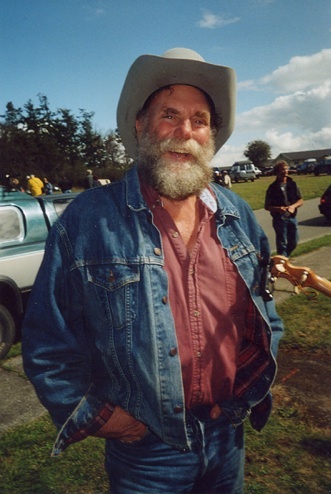 At the 2004 American Banjo Camp in Washington State, I met the guy pictured above (I can't recall his name). He was a rancher from arid eastern Washington near the Idaho pan handle. Several campers listened as he told about the time he traded his much sought-after banjo — an old Gibson Mastertone — for seventeen tons of hay. We all laughed and told him he'd been bamboozled. When the laughing died down, he said, "Do you know what seventeen tons of hay cost?" We all conceded that indeed we did not. Anyway, point is, this guy seemed like a truly authentic folk character — The Genuine Article. So I asked him how he got into playing the banjo, hoping he'd say it was a family tradition going back centuries. Instead, he said "Well, when I was a kid, I was very heavily into the Rolling Stones. And their liner notes said they owed it all to Muddy Waters. So I got some Muddy Waters albums, and that got me into Robert Johnson and Charlie Patton records, and that got me to Harry Smith and Dock Boggs, which got me into bluegrass and ... well, twenty years later, here I am at Banjo Camp." I'm happy to list some of the places I've been, but I wouldn't think of it as a road map. It's mind-boggling how much stuff is out there today, and how many paths there are into and out of The Anthology. Once you've memorized The Anthology and scoured its liner notes, you may want even more supporting material. Anthology of American Folk Music is an invaluable but out-of-print book from Oak Publications. I found a hard copy from an online bookseller, but this electronic version at Tower of Babel will also do nicely. Volume 4 was released in 2000 by Revenant, where it promptly went out of print (which is why I wish Folkways had done this, as nothing goes out of print there). Smith had long planned this fourth volume, but his attention span expired. It's wonderful — maybe you can find it used somewhere. Invisible Republic: Bob Dylan's Basement Tapes by Greil Marcus. In a way, it's a book-length argument that the spirit of The Anthology deeply animates Dylan's vision — even more so AFTER he "went electric." I think you need to know this book to go any further. It's been renamed and revised, but I only know this first version. When We Were Good: The Folk Revival by Robert Cantwell — especially Chapter Six, "Smith's Memory Theater." Cantwell's writing is often dense and difficult (in a postmodern cultural studies kind of way) but if you can figure out what he's saying, he'll change your life. I've returned to this beautiful chapter again and again over the years. 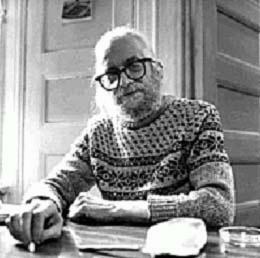 Think of the Self Speaking: Harry Smith — Selected Interviews is for the serious Smith-head. It's easy to forget that the highly honored and influential Anthology was put together by a border-line homeless weirdo whose main source of income was often small-time dope peddling. This collection of interviews is frustrating, hilarious, tedious, inspiring, illuminating. Mostly, it's a sad reminder that Allen Ginsberg was right about what becomes of the best minds of his (and your) generation. Find out what ELSE the people on The Anthology recorded — that is, find out what Smith chose from to arrive at The Anthology. Here are my favorites so far. The Carter Family: In the Shadow of Clinch Mountain. The fact that I laid out the cash for this Bear Family box set suggests how important I think the Carter Family is (it sure as hell doesn't mean I've got the money to spend — you might want to go for some of the box sets put out by JSP instead). You know ... sometimes I walk down a crowded street and am suddenly saddened, thinking "Most of these people don't know about the Carter Family." The Complete Blind Willie Johnson and its liner notes. Johnson is a gospel musician, so the central themes of his work go back to African American slavery, and back through all of Western literature, and ultimately to Jewish slavery and the Torah. This may be why his artistry can seem to take on layer upon layer upon layer. It's DEEP. Don't screw around with any "selected" collection — go for the Complete. 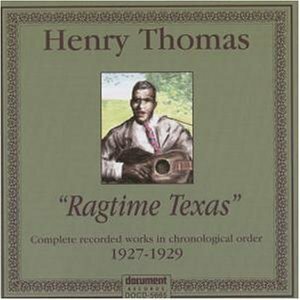 The Complete Henry "Ragtime Texas" Thomas. Despite their wild differences, Thomas is like Willie Johnson in that a Great Theme gives his art a depth that opens up beneath you and swallows you up. Born less than a decade after the abolition of slavery, his theme is travel — the road's promises of freedom and its ever-present threats of sudden terror. Dock Boggs: His Folkways Years, 1963-1968. Boggs is like the greatest old Irish storyteller you'll ever meet — you never know whether to laugh or cry. These years that Dock Boggs and Mike Seeger spent together have a mythic status in my mind — like Dylan and Guthrie at Greystone Hospital, or like Johannes Kepler at Tycho Brahe's bedside. The difference is that Seeger made recordings. Bascom Lamar Lunsford: Ballads, Banjo Tunes and Sacred Songs of Western North Carolina. After many weeks of listening exclusively to this, I stood on the shore of Lake Superior and tried an impersonation of Bascom Lamar Lunsford. To my surprise, what came out was a terrible Lunsford, but a great Bob Dylan. I think not only Dylan's voice, but his approach to imagery and meaning owes a large, mostly unrecognized debt to Lunsford. Original Folkways Recordings of Doc Watson and Clarence Ashley, 1960-1962 documents one of the great moments of American music — Ralph Rinzler's simultaneous rediscovery of The Anthology's Clarence (Tom) Ashley, and his discovery of the young Doc Watson. The collection has the sound of music being reborn. Reading a song as sheet music is like looking at a roadmap of a city, while hearing an actual recorded performance of a song is like visiting that city and eating its gumbo. That's the big shift in which Harry Smith's Anthology participated. Technology and imagination allowed The Anthology, The New Lost City Ramblers, and Alan Lomax to put the true sound of real folk music right into people's ears — and it literally remade the world. New Lost City Ramblers, 40 Years of Concert Performances. A great introduction to the Ramblers, with many stories told between songs, plenty of laughs, and brilliant musicianship. You can hear the guys grow to a venerable age right before your ears. Tracy Schwarz's introductory comments about "I've Always Been a Rambler" are alone worth the price. New Lost City Ramblers: The Early Years, 1958-1962. Selections from the Folkways albums before Tom Paley left the group. Particularly surprising for these Patron Saints of Oldtime is all the bluegrass they played so capably. Particularly amusing are all the bawdy and politically questionable songs such as "Sales Tax on the Women" and "Sal's Got a Meatskin." Out Standing in Their Field: The New Lost City Ramblers Volume II, 1963-1973. Selections from the albums recorded with Tracy Schartz in the line-up. I love the ever-timely Roger Miller song "Private John Q," the hilariously bad-news "Dear Okie," John Cohen's insanely shaggy shaggy-dog story "Automobile Trip Through Alabama," and the worryingly moving Freudian parable "The Little Girl and the Dreadful Snake." For more on the Ramblers see The New Lost Times. Third Annual Fairwell Reunion. I carry around these CDs by founding Rambler Mike Seeger like the American President's nuclear football — they're never far from my side. Mike has done more than any other living person to make the music of The Anthology a living reality in the hearts and hands of people like us. Like the Ramblers themselves, Mike is not a nostalgic impersonator of old records — he's very much a new thing, a creature of today and tomorrow. The Alan Lomax Collection Sampler. A brilliant way to get a sense of what Alan Lomax preserved in his journeys through America, and during his McCarthy-era exile in Europe. A good third of these performances by longshoremen, patrons of taverns, and prisoners in work crews just don't seem possible — they're too beautiful and strange. 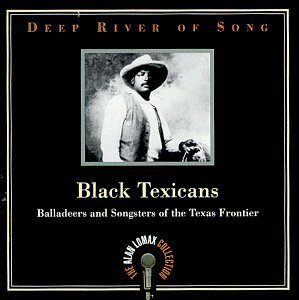 Deep River of Song: Black Texicans. The reason I choose these recordings of black Texans over all the other Lomax recordings I own is that they just happen to blow my mind so consistently. Lomax recordings have a startling immediacy — you feel like you're there watching the thing get recorded, every time you hear it. If I could sit down with you and spin some disks, I might just start you off with Butter Boy's freaky "Old Aunt Dinah." It's silly to list performers influenced by The Anthology, since just about everybody's world has been transformed by it, whether they know it or not. But here's a few people I happen to like, and who just seem to smell like Harry Smith — they have The Anthology and/or Lomax and/or the Ramblers written all over them. Then there's all the more popular (for better or worse) singer-songwriter acts who Smith-ites might like. 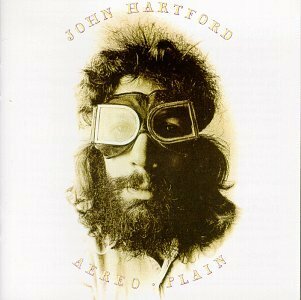 Recordings I really like and tend to associate with the Anthology are Jolie Holland's Escondida, Gillian Welch's Time the Revelator and Revival, John Prine's John Prine and Diamonds in the Rough, John Hartford's albums, the great and unavailable Aereo-Plain and the very strange Mark Twang, Tom Waits' Mule Variations, and The Handsome Family's Through the Trees. Also, for all that can be said about Bob Dylan's debt to The Anthology, Alan Lomax, and The New Lost City Ramblers, I think Good As I Been To You and World Gone Wrong are the Dylan albums that make the point most clearly. They're also among Dylan's best, it seems to me, and like his first album, they're heard far too rarely. Oh dear, a whole load more records to absorb, thanks! Going to see Charlie Parr perform next month, I know very little about him but am now even more eager with anticipation. Great post. I haven't encountered so much of that stuff. Man, exploring this music is like exploring an old haunted house where every door opens to another hallway filled with doors. You could get lost and spend your whole life wandering in Texas Blues, or Child Ballads. I love that Clarence Ashley / Doc Watson & friends double-CD. "The Coo-Coo" on the first disk is transcendent, as good as it gets. I'd also recommend Nick Tosches's impressionistic/obsessive book "Country." And one of my favorite Smithsonian/Folkways CDs, Doug and Jack Wallin. It's mostly old Doug singing ancient a cappella ballads, and it's spine-tingling. The few stringband numbers on there are excellent too. Great post indeed! I would just add something by Dave Van Ronk, maybe "His Folkways years" or "Inside Dave Van ronk". and you should see Harry Smith's films. Wow. You have a picture of John K. up there. That guy sure knows hay.